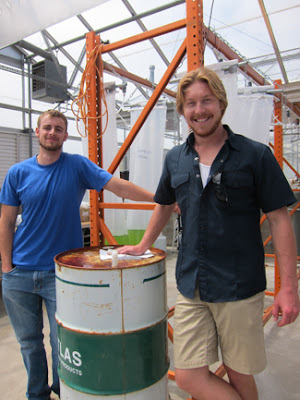 The Biology Field Station at the University of California San Diego (UCSD) is home to a thriving center for cutting-edge experiments made possible by the San Diego Center for Algal Biotechnology (SD-CAB) in support of research aimed towards understanding and developing eco-friendly energy solutions, like the 1 Barrel for Baja (1BFB) project. 1BFB is a student-based undertaking, which started and quickly gained momentum based on scientific collaborations between laboratories at UCSD, the Salk Institute, the Scripps Institution of Oceanography (SIO), and San Diego State University with funding from the US Department of Energy and local private industries. Kristian Gustavson is a former Master’s student from Dr. Jim Leichter’s Laboratory at SIO. He is the visionary behind the 1BFB initiative, and continues volunteering at the Field Station to further the progress of the project. Gustavson, along with Nathan Schoepp, a Chemistry graduate student in Dr. Michael Burkart’s Laboratory at UCSD and five undergraduate volunteers from the Biofuels Action and Awareness Network (BAAN) helped construct the greenhouse and the wet laboratory. Both facilities function as factories for growing algae and are rapidly expanding to accommodate the demands of the 1BFB endeavor. of algae in various stages of growth. Algae are a broad and diverse group of organisms that make complex organic compounds. They grow significantly faster than conventional food crops such as maize and soybeans. They also thrive in warm, arid, and salty climates, making them an attractive alternative to other crop-based biofuels and the greater San Diego area a prime location for their cultivation. 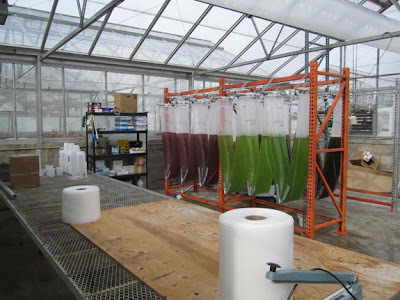 Schoepp summarizes the process of taking algae from the greenhouse to the barrel: first, large bags that hold 50 to 100 liters of freshwater algae are inoculated with one of three algal production strains that have been specially engineered for better growth. A continuous supply of both air and CO2 is pumped through the bags for four days. After this incubation period, the algae are harvested and their biomass, the biological material containing important fuel precursor molecules, is isolated by centrifugation. The biomass is then sent to Dr. Skip Pomeroy’s Laboratory at UCSD, where the lipids and fats and are extracted and further converted into usable diesel fuel. Gustavson’s goal is to obtain enough biomass to fill one 42-gallon barrel with biofuel (also known as B100 biodiesel). In an effort to scale up the production by the end of the summer, Gustavson and Schoepp plan to grow 300 to 500 liter algal cultures in large plastic pools of saline water. They hope to eventually build an in-ground circulating pond where bulk volumes of algae can be cultured. Optimizing the growth of one algal strain and promoting its use as a renewable form of energy to local companies is the next step for Gustavson. “This is a good opportunity for UCSD to lead the way in applied algal biotechnology,” he says. The Baja 1000 is a series of off-road desert races that will take place on November 17th, 2011 in the Baja California Peninsula. The race is sanctioned by SCORE International and often showcases new technologies in motor vehicles. Gustavson will race one of three diesel enduro motorcycles from Holland using the fuel that he and his team have produced from start to finish. The success of the One Barrel for Baja project has also been made possible with the help of Drs. Steve Mayfield, Greg Mitchell, Michael Burkhart, Skip Pomeroy, and Dominick Mendola.